Creative Wiz Kids was started in 1990 in New York City by Frances Bildner. A professional painter who has exhibited in Europe and the U.S., Frances’ philosophy is “learning through play not pressure”. Frances started Creative Wiz Kids because she saw the number of playgroups that ignored the natural curiosity and creativity of children. By basing her playgroups’ activities on children’s ability to learn through play, and their inherent desire to grow and explore, Creative Wiz Kids has become a centre for child-focussed learning and expression in London. If you’re interested in one of Frances’ paintings, please contact her directly or search Frances Bildner at www.francesbildner.com to view her work at various web sites. The Philosophy at Creative Wiz Kids is a simple one. Children are all natural artists and learn best in a relaxed unpressured environment. At Creative Wiz kids the emphasis is on the artistic process not on the finished product. Although our Wiz Kids have produced lovely work, it is in the process of “making” be it Art, Dancing or Acting where children gain the most benefit. Great Emphasis is placed on play and fun. In an increasingly hurried world, we at CWK believe it is essential that children are allowed and encouraged to enjoy the play and pleasures of childhood. 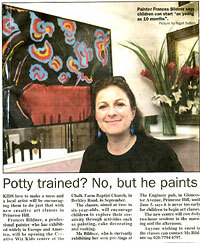 Artist and Poet, Frances Bildner, who started CWK in New York City in 1990 enthusiastically runs the programme in Hampstead and Notting Hill with her band of loyal helpers, all of whom have Arts backgrounds as well as loads of energy, experience and creativity to share with all Wiz Kids. Davina has been working with Creative Wiz Kids since 2009. Trained as an actor, Davina runs drama workshops for children and has experience delivering sessions focused on devising, storytelling, puppetry, movement and Make & Play. She has delivered worshops in a variety of settings including theatres, schools, playgroups and festivals. Davina is a core member of Page One Theatre Company where she works as an associate artist creating theatre for children, and as the Education Director devising and delivering Page One workshops. Kremena Dimitrova is a London based Illustrator, Designer and Art and Design Lecturer/Tutor. She studied Intensive Foundation in Art and Design, BA in Illustration and Postgraduate Certificate in Higher Education at Middlesex University and Masters in Art and Design in Education at UCL Institute of Education. Kremena experiments with drawn and painted backgrounds, textures, ephemera, and photographed material, which she combines into digital collages. Her work is inspired by historical accounts, vintage art, folk tales and superstitions, current affairs, and by her travelling adventures. Kremena makes themed prints, personalised portraits and illustrated merchandise, which are made and printed in England. Kremena has worked on a range of privately commissioned and self-initiated projects, and has had a number of published works. Her work features in print, online, book publishing, design, and advertising. As well as working to commission, Kremena also exhibits and pursues her own practice relating to the museum and heritage sector. She investigates what kind of learning can emerge from and with illustration practice when interpreting archives and collections. 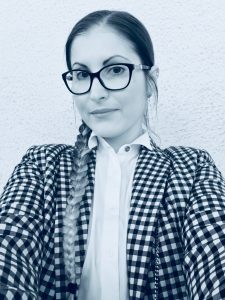 Kremena’s experience and interest in this area has led to her decision to embark on a practice-based PhD in Visualising History at the School of Art, Design and Performance at the University of Portsmouth in February 2019. Wendy is an experienced international performer and coach in the art of expressive communication – from physical theatre to recorded and digital media. Her skill is in creating bespoke learning environments that ensure participants of any age and at any stage of personal or professional development are able to find their voice and bring their unique gifts to the party of life. Jose Rico. Toledo (Spain), 1981. Professional musician with more than 15 years of experience, playing different styles (Jazz, Be- bop, Rock, Pop, Reggae, R & B, Latin, Samba, Hip-Hop, Flamenco, African Grooves, etc …). He has traveled, studied, taught and performed in different countries, always trying to expand his knowledge and experiences to translate them later into music. He has a superior technique as a jazz musician and has studied with great drum masters such as Daniel “Pipi” Piazzolla, Carlos Carli, Marcelo Blanco, Alberto Cabello and musicians like Carlos Lastra and Osvaldo Burucúa. He has also recorded studio albums, touring various countries in Europe and South America, and has participated in numerous musical projects and has been leader of two jazz quartets. I have loved dancing as long as I can remember, however I didn’t officially start until I was 8 years old, doing vocational dance exams and performances in jazz, modern, ballet and tap. I have achieved a Distinction in these styles up to a high level. Notable performances and roles include playing the Sugar Plum Fairy in a production of The Nutcracker, performing at Disney land Paris, Sadler’s Wells theatre, the Savoy theatre and a performance for the WWF charity. I also trained for a couple of years at The Place, London in contemporary dance. styles, including professionally for KSPARK Entertainments in a performance at The Indian Curry Awards ceremony, Grosvenor Hotel, among others. I am currently training with the London Dance Company in a large range of styles, and will be competing for them at competitions in the future. Amy studied at London College of Music, gaining B.A. Hons degree in Musical Theatre. She completed the Early Years Foundation learning how to use singing and play in the early years curriculum. Amy is part of the Theatre of Adventure Company, specialising in walkabout acts, comic improvisation and interaction. Amy works for the Soundhouse Recording studios specialising in BBC radio dramas. As a teacher, Amy teaches Theatre in Education workshops for local schools and West end and a ‘Dance Moms’ inspired class for Notting Hill Ballet School. Amy teaches Performing Arts on a weekly basis at Stagecoach Theatre Arts in Ealing and Kew. She has been continuously praised by inspectors, and asked to mentor others within the network. Amy works for the charity ‘Spread a Smile’ who spread smiles to seriously ill children and teenagers in hospital by providing entertainment, and are supported by children in need. She can also be found working as casting assistant at Candid Casting. She is a voice over artist, voicing adverts for E.on, Network Rail, VeloCityCycling, Tam Airlines, O2, Morrisons and TV series Marley’s Ghosts. Along with her biggest venture voicing for for a world renowned technology brand that we still aren’t allowed to shout about. 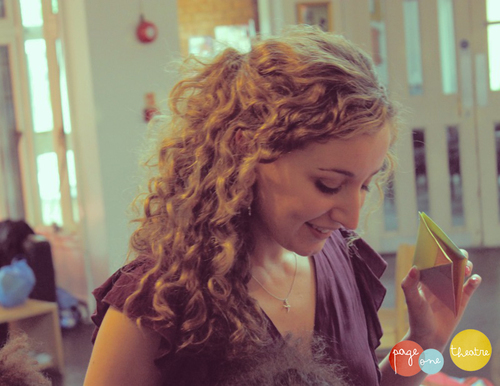 Amy also regularly hosts children’s birthday parties providing theatre and fun all round! Annette Pfeffer is a London based Norwegian artist with a PGCE in Art, Design and Museology from the Institute of Education and 5 years experience as a Teaching Assistant. She also has a B.A.(Hons.) in Visual Studies from NSAD and has been collaborating or running Art based workshops for a range of age groups since 2001. Many of these have been through Creative Wiz Kids, with whom she has had a long standing professional relationship. Artistically Annette has a broad skills base, from Printmaking to Prop-making, but believes that art is primarily about enjoyment and experimentation. As well as being a formidable face-painter, she is also a former lead singer of a Cambridge based band, managed by Katrina and the Waves. Annette is not adverse to performing to an audience of children or adults and enjoys a good party (and a slice of cake). Anna Orson is a puppet maker and Artist. She has been working as a maker, designer and workshop leader for theatrical companies, carnival companies, community groups, schools and hospitals. She has a BA honors in Theatre Practice specializing in puppetry and a an art foundation specializing in fine art. Paint, puppets, costumes, sculptures, installations, masks, lanterns, free play, improvisation… and so much more. She employs principles of play, creativity and interaction: ideas can be changed and improvised to fit different needs. Although each workshop has an objective, the main feature is ‘PLAY’ – to encourage the children to express themselves without inhibitions. ‘I believe that arts, crafts and especially puppetry are wonderful forms of stimulating expression and communication, which help children to express themselves creatively without inhibition’. Her recent workshop projects include: Kori Art (story of Ese using puppetry and masks), Haringay Life Roots (Christmas lantern carnival) Royal Free Hospital, Taru Carnival Company (Thamesmead River Festival), Arts Depot Finchley (The Twits Christmas Show & Installation), Art Burst (School Holiday Puppet Club) and Design Build & Play (Community Project – Artist & Residency).